We understand that doing anything for the first time can be scary. 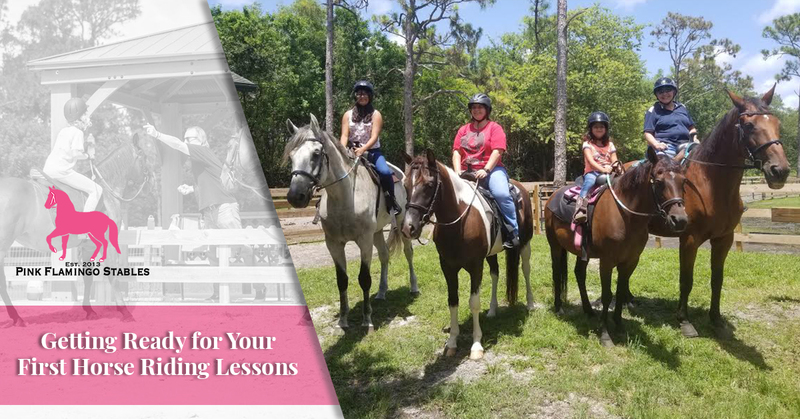 Here at Pink Flamingo Stables, we want to do everything we can to make sure that your first lesson at our Lake Worth horse stable is a fun and stress-free experience for you and your horse. Our local horse riding lessons will not only help you feel more comfortable on your horse, but they will also teach you the ins and outs of grooming, tacking, and bathing your horse, allowing you to fine-tune your riding skills. In today’s post, we will review a few tips that can help you prepare for your first lesson — let’s get started! First and foremost, finding the right horse stable is the best way to ensure you have a great riding experience. 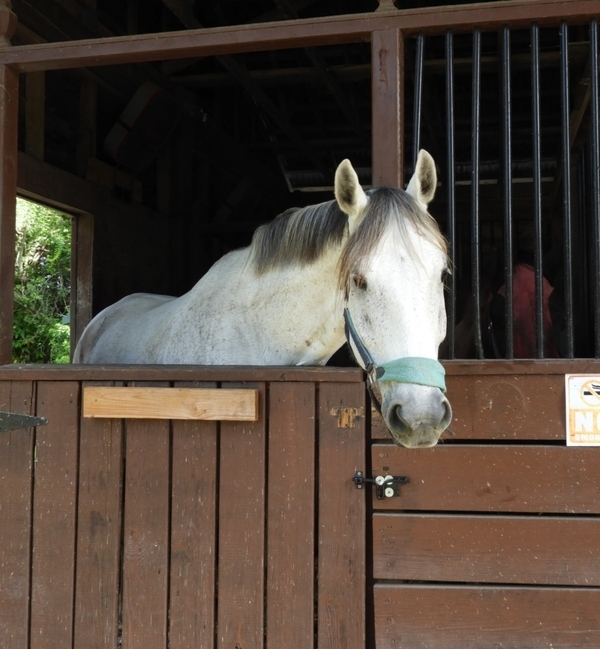 Visiting potential stables before you sign up for horse riding lessons allows you to see the horses and stable grounds. Of course, you wouldn’t expect a stable to be spotless, but the stables themselves should be clean and well-kept, and the grounds should be free and clear of excess debris. Most importantly, the horses should be clean, fed, and well cared for, and tack should be stored properly and well-maintained. Once you have found the best horse stable in your area, it is time to get ready for the big day when your first lesson will take place. You want to be safe and comfortable during your horse riding lessons, and choosing the right clothing goes a long way to making sure this is the case. Scarves and other loose articles of clothing should be avoided, as they can get tangled in equipment. Choose a shoe with a closed toe and low heel to ensure your feet don’t slip out of the stirrups and wear long pants to prevent any chafing from the saddle. A helmet is a must for safety, and we will provide one for you, along with all the other tack and equipment needed for your lesson. Proper hydration is always important. However, it is even more important to make sure you are adequately hydrated before your horse riding lessons. Many of our students are surprised by how much of a sweat they work up simply by riding a horse, and this is something that definitely happens in our hot and humid climate. Dehydration can affect your mental clarity and your physical strength, both of which are essential for your safety during your riding lessons. That being said, be sure to drink plenty of water before you come, and remember to bring a water bottle with you to stay hydrated throughout your lesson. Most of our students are excited to be starting their horse riding lessons, and it is a rare occurrence for someone to be late. Arriving 15 to 20 minutes early is always recommended, however, early arrival very important for your very first lesson. You want to have plenty of time to get to know the horse that you will be working with as well as the instructor who will be leading your lessons, and arriving right on time or late won’t provide you with the opportunity to do either. If for any reason you believe that you will be late for any reason, please let us know as soon as you are able. Breathe, Relax, and Have Fun! Finally, to ensure that you have the best riding experience possible, it is important that you are relaxed and comfortable with your teacher and your horse. We have found that many people tend to feel nervous around horses for the first time, and this is understandable, as horses are very large animals. However, remember that horses truly are gentle giants, and those that are housed in our horse stable are used to working with people. If you have any concerns or you feel nervous about working with a horse for the first time, just let us know! We will do everything we can to help you relax and feel more comfortable. Whether your child is preparing for his or her first lesson, or you are getting ready to hop into the saddle for the first time yourself, you can trust the team here at Pink Flamingo Stables to make our riding lessons safe, fun, and enjoyable. We pride ourselves in providing some of the best horses and cleanest horse stables in Lake Worth, and we are confident that you will agree that we provide the best local horse riding lessons that money can buy. If you have questions about your first lesson with us, please give us a call at 516-650-6555 today. You may also check out our FAQ page to see if there is an answer to your question there. We look forward to seeing you soon!